Exposure Triangle is made of three points as if forming a virtual triangle which can be explained in illustration. These are – Aperture, ISO and Shutter Speed. When we press the shutter button on our camera, for a short period of time the light passes through the lens hitting the sensor staring into an image – actually the process of creating an image is more complex, but for now we just this is enough. So, take a picture means, roughly means capturing the light coming reflected from the scene that we are framing. Exposure Triangle has a big importance in the learning curve of Digital Photography. Aperture : Aperture is nothing but the opening of the camera for light to enter right behind the main lens assembly. Good in detail article can be read are – Aperture in Digital Photography and Lens Speed. ISO Value : ISO Film speed in Digital Photography is widely used to denote the photographic surface sensitivity to light and the way it might behave under ideal condition as written in our detail article on ISO. Shutter Speed : Shutter Speed in Photography is related to Exposure. The control of Shutter Speed on a camera is by a purely mechanically or electronically controlled knob. Read more on Shutter Speed. All digital SLR cameras allow you to adjust these three parameters, even some compact digital allow you to control, it is important to know. Together, aperture, exposure time and ISO form the exposure triangle. For a photographer who does not want to be limited only to automatic shooting modes, it is essential to know how these three parameters interact with each other and how to contribute to create a correct exposure. In addition, they significantly affect the aesthetics of the photo, as a result, their in-depth knowledge enables greater creative control and quality of the pictures. The Exposure Triangle – sounds like The Customize Windows ! 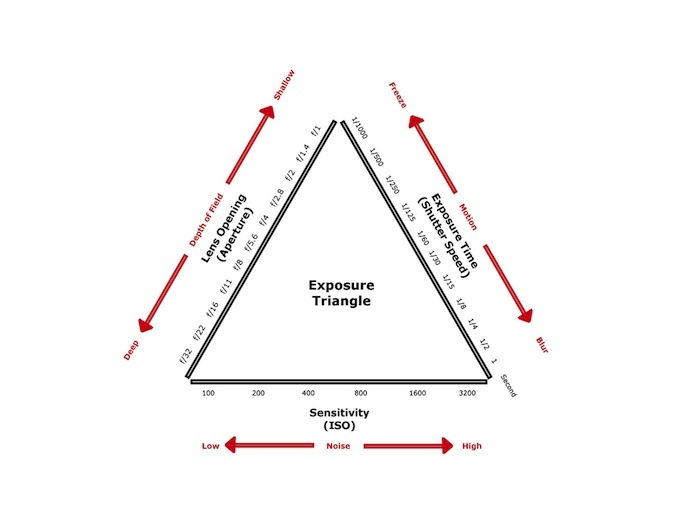 The is possibly unnecessary, but usually it is added to emphasize that we are talking about that very exposure triangle we traditionally know. The three parameters in the triangle are closely linked. In fact, to ensure that the same amount of light to reach the sensor, may be multiple combinations of aperture, exposure time, and ISO can be used. For example, when we increase the exposure time, we can obtain the same exposure by decreasing the aperture and leaving the ISO unchanged. If we increase the ISO, we can decrease the exposure time leaving unchanged the opening and so on. Put like that, the discourse concerning the exposure triangle seems pretty simple : it would be a pure play arithmetic to find the right combination between shutter speed, aperture and ISO, so also are available many equivalent solutions. Increasing the ISO cause an increase in noise, which is more visible when dark tones are present in the picture. So, basically it is theoretically fully valid but as there is no perfect and ideal camera system exists, Exposure Triangle has a limitation. Knowing the limitation is called practice keeping the theory in mind. Aspherical Lens in Digital Photography is designed to correct the aberrations produced by the usual spherical and optically differs from the spherical shape. Exposure Lock (AE-L Button) is the abbreviation stands for Automatic Exposure Lock. It is useful using automatic and semi-automatic shooting modes. Cite this article as: Abhishek Ghosh, "Exposure Triangle," in The Customize Windows, April 27, 2013, April 26, 2019, https://thecustomizewindows.com/2013/04/exposure-triangle/.